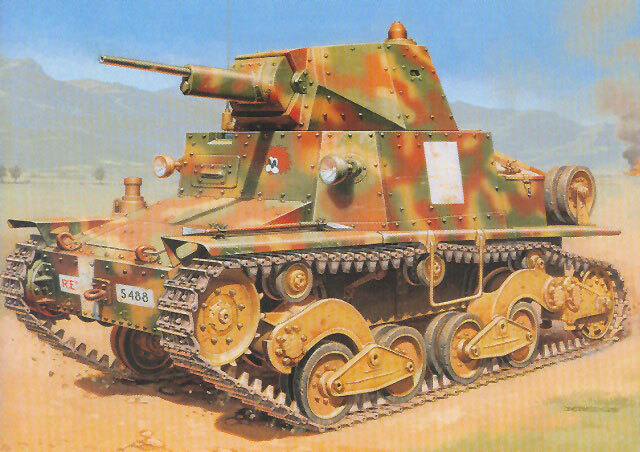 Italeri made a splash in the modeling world 33 years ago when they released their M13/40 medium tank kit. While it was later noted as having a number of flaws and problems, it was a step ahead of anything else on the market at the time and did make Tamiya wake up to the fact they now had a worthy competitor. (They later produced their own M13/40, and modelers still argue about which one is better on the internet.) But other than the Semovente 75/18 they never produced any other Italian armor kits until today with the release of the L6/40 light tank. This kit is not as earthshaking as the M13/40 was in 1975, but it is a very nicely done kit in its own right and for fans of Italian armor a “must have.” It comes with an interior for the front part of the hull and the inside of the turret; while the rear engine access doors are separate there is no engine for the engine bay, so that will wait on the after-market boys. The moldings are of a higher standard than some recent Italeri kits and there is even rivet detail INSIDE the turret shell, as a matter of reference. Most of the ejector pin marks are in inconspicuous places so not a major problem. Some parts such as the 20mm Breda cannon are simplified so perhaps some may want to wait on an after-market detail set. The tracks are “link and length”, but as with the original are very small and narrow or about the size of 1/72 scale main battle tank sized links. Extreme care will be needed in removing the single links for “wrapping” the tracks though as Italeri has the sprue connections in the center of the sides of the links rather than on their ends. While I think they did this to ensure a good and complete link would be formed, it makes it more difficult to get a clean cut. As these links have to “nest” one inside the one in front of it they also will have to be cleaned up, so plan on taking some time to get it right. The suspension can be adjusted if desired and left partially working, which can help in installing the tracks but at least with “link and length” will not cause the bowing that other Italeri suspensions caused with vinyl tracks. There are five different finishing options provided in the kit: 31st Mechanized Regiment, Balkans, September 1943 (tricolor with white rectangles and a cartoon lion); 31st Mechanized Regiment, June 1943 (tricolor with white circles and Mickey Mouse; however on this decal sheet Mickey has gone “blind” as the eyes were left out! ); Novara Lancers, North Africa 1942 (sand with eagle insignia and white 2); 67th Bersaglieri Battalion, Russia 1942 (sand and green with blue rectangles); and German Anti-Partisan forces, Balkans 1944 (tricolor with crosses). From the breakout of the parts the answer is yes, Italeri obviously plans to follow this kit up with the Semovente da 47/32 tank destroyer variant. Overall the kit is nicely done and while a bit pricey to some does come with the book, which would easily got for $18 or more on its own. With obscure items, kudos to Italeri for using this method of helping modelers get good references with the kit!